Provides a collection of implementations of services. The factories for instantiating objects of implementations are accessed via a service name. The com::sun::star::container::XContentEnumerationAccess interface can be supported optionally. If it is supported, it is possible to enumerate all implementations that support the service specified with the argument of com::sun::star::container::XContentEnumerationAccess::createContentEnumeration(). The enumerator returns interfaces. The type of the interface is not specified. 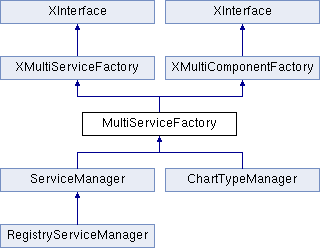 Commonly this is XSingleComponentFactory. This interface uses a service name and a component context to instantiate a component which supports the specified service. This interface uses a service name to instantiate a component which supports the specified service.